You don't need to live in the big city to know what it's like growing up poor, according to Mike Epps. Long before the comedian/actor made a name for himself on "Def Comedy Jam" and co-starred in movies like "Next Friday" and "All About the Benjamins," the Indiana native struggled to make it through childhood. Gang activity, brushes with law enforcement and other unsavory behavior dominated his life, and he ended up dropping out before reaching high school. Fast forward a couple of decades, to a period where Epps is living large. He's taken a short break from Hollywood to focus on stand-up comedy, although roles await him in another "Resident Evil" sequel and a Richard Pryor biography upon his decision to return. This year will also see Epps emerge as a recording artist. He returned home to Indiana last week to shoot a music video, and expects to release a full-length album later this year. "I'm just rolling like I'm supposed to roll," the 34-year-old said Monday by phone from Idaho, just minutes before he was scheduled to perform. "Get ready Hawaii, get ready for this hurricane -- no, not this hurricane, this lava -- this lava to come through!" LIKE A lot of other comedians, Epps knew early on that he had a knack for making people laugh. "Well, you know, I've always been funny," he said. "So that was a way to get out of trouble and get into trouble (at the same time), you know?" With Pryor as an influence, he began to seek out stage time at local comedy clubs, honing his craft and looking for bigger opportunities. He eventually moved to New York, where appearances on "Def Comedy Jam" in the early '90s helped establish him amongst the competition. "From there, I moved out to L.A. and met Ice Cube," Epps said. "He put me in the movie 'Next Friday,' and I've been working ever since." Although he previously appeared in the film "Strays" and had a small role in an episode of "The Sopranos" in 1999, it was his performance as the marijuana-smoking Day-Day Jones that jump-started his career. 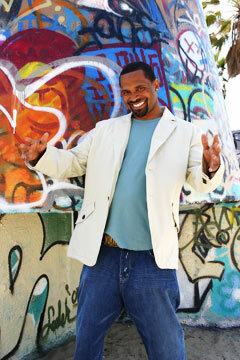 Epps followed up with parts in "Dr. Dolittle 2," "How High," "Friday After Next" and "Malibu's Most Wanted." In 2004 and 2005, he began to grow beyond simple comedies, with roles in "Resident Evil: Apocalypse" and "Roll Bounce." He also was the executive producer and co-starred with Cedric the Entertainer in a big-screen remake of the classic television show "The Honeymooners." "I try to executive-produce most of my stuff," Epps said. "I also executive-produced 'All About the Benjamins.'" While movies are on the back burner for now, don't expect to see him in the same comedic roles upon his return. Epps hopes that filmmakers will see his talent and allow him to play different types of characters. "Eventually, I want to do some romance, some drama," he said. "I'm branching out ... making the right decisions and stuff." 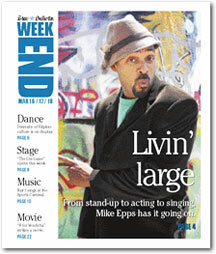 In his last movie "Something New," Mike Epps took on a more romantic role. The movie also starred Wendy Raquel Robinson, left, and stand-up comedian Sommore. GETTING BACK to his stand-up roots is a top priority this year. "I like stand-up almost more than I do movies," he admitted. "It's instant gratification, and the jokes are really coming from me, you know what I mean?" Epps has already filmed a comedy special for HBO, and is in the process of developing a new show for the cable network. "The Unsuccessful Thug" will take a look back on his childhood in Indiana. Music also plays a bigger role in his life these days, although filming a music video reminded him of making movies. "It was kind of like acting," he said. "Laying down the words, saying the right things. But I've got the album done, and now I'm piecing things together." This month's trip to the islands will serve as a working vacation for Epps, with a few days of rest and relaxation to follow his performance on Friday. He'll return with his wife, whom he married on Maui. Then it's back to the grind. "I'm just doing my stand-up, and getting geared up to do this HBO (stuff)," Epps said. "But I love Hawaii. That's my spot."